CSA Czech Airlines a.s. (Czech: ČSA České aerolinie, a.s.) is the national airline of the Czech Republic. 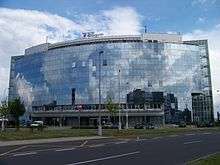 Its head office on the grounds of Václav Havel Airport Prague in Ruzyně, Prague. ČSA was the second airline in the world to initiate successful jet airliner services (in 1957 using the Tu-104) and simultaneously the first airline to fly regular jet-only routes (between Prague and Moscow). Today, it operates scheduled, charter and cargo services. The airline runs a frequent flyer programme called "OK Plus" in reference to the airline's IATA designation, as well as the term of approval; OK also featured prominently in its previous livery, and is the prefix for the Czech Republic on aircraft registrations. It is a member of the SkyTeam alliance. As of 2015 Czech Airlines has three main shareholders, Korean Air, Travel Service, and Czech Aeroholding. Czech Areoholding is a group of companies that operate in air transportation and related ground handling services. Other subsidiaries of Czech Aeroholding are Prague Airport – the operator of the international airport Prague/Ruzyne, Czech Airlines Technics providing services in technical maintenance of aircraft and Czech Airlines Handling providing passenger and aircraft handling. CSA was founded on 6 October 1923, by the Czechoslovak government as CSA Československé státní aerolinie (Czechoslovak State Airlines). Twenty-three days later its first transport flight took place, flying between Prague and Bratislava. It operated only domestic services until its first international flight from Prague to Bratislava and on to Zagreb in 1930. After the dismemberment of Czechoslovakia in 1939 with the country splitting up into three parts, the airline was terminated. In February 1948, the Communist Party used the dismissal of right and centre parties' ministers to take power in Czechoslovakia; later it suspended some western European and Middle Eastern routes, and, also because of the embargo imposed by the West on the western-built aircraft spares etc., gradually replaced much of the fleet with Soviet-built airliners. The venerable Ilyushin Il-14 was even updated and built under licence in Czechoslovakia as the Avia-14. In 1950, CSA became the world's first victim of a mass hijacking. The three Czechoslovak airliners flown to the American air base in Erding, near Munich, stirred the world on both sides of the "burnt through" Iron Curtain and the case intensified the Cold war between East and West overnight. Three Douglas Dakota airliners landed in the morning of 24 March near Munich instead of at Prague. The first one, from Brno, at 08:20, the second one from Moravská Ostrava at 08:40 and the third one from Bratislava at 09:20. Two thirds of the people on board were involuntary passengers who later returned to Czechoslovakia. The Czechoslovak communist government commissioned a 'flight to freedom' book, stage play and film (all bearing the name "Kidnap to Erding") which celebrated the kidnapped returnees as heroes who had not allowed themselves to be swayed by promises of capitalist opulence. The non returnees who requested political asylum in the American zone of West Germany were, on the other hand, proclaimed criminals and the Prague regime vigorously requested their extradition – although in vain. The pilot from Brno was Josef Klesnil, a former Royal Air Force pilot with 311 squadron, who flew from Brno to Erding with a pistol at his head. A Czechoslovak Airlines Tupolev Tu-134A, OK-EFK in 1970s at Pisa Airport. In 1957 CSA became the third of the world's airlines to fly jet services, taking delivery/putting in service the first Tupolev Tu-104A in 1957. CSA was the only airline other than Aeroflot to operate the Tu-104 which was the world's first successful jet airliner. The service operated by the Tu-104A from 1957 between Prague and Moscow was the first jet-only connection (other airlines used both jets and piston/turboprop aircraft simultaneously). The first transatlantic services started on 3 February 1962 with a flight to Havana, using a Bristol Britannia turboprop leased from Cubana de Aviación. CSA's transatlantic flights were code-shared with Cubana's own services to Prague, and Cubana's crews provided initial training and assistance in the operation of the Britannias. From the late 1960s, CSA used a range of Soviet-built aircraft, and modifications of them, for its extensive European and intercontinental services which totalled some 50 international and 15 domestic destinations. The Britannia was replaced with long-range Ilyushin Il-18D turboprops at this time, and transatlantic routes were established to Montreal and New York City, besides Havana. Apart from the Il-18D, other aircraft in CSA's fleet included the short range Tupolev Tu-134, the medium-range tri-jet airliner Tu-154, and the long-range jet airliner Ilyushin Il-62. As was the case in several other countries, the Il-62 was the first long-range jet airliner to be put into operation by CSA (which was also the first foreign customer to buy Il-62s from Russia). The plane has a range of 10,300 km and for some time was operated concurrently with the Il-18D (range = 6,500 km). CSA operated a fleet of 21 Il-62s between 1969 and 1997 including 15 Il-62s and six (later model) Il-62Ms, 15 of which were registered under the OK designation and six being leased from Aeroflot. A CSA-registered Il-62 and three Il-62Ms were used as official Czech government transports between 1974 and 1996. The CSA Il-62 with call sign OK-DBF was lost in an unfortunate accident due to language mis-understanding between the crew and the control tower during a nighttime approach to Damascus in 1975. After absorbing the "heavier" part of the Slov-air operator and taking its Let L-410A Turbolet turboprop commuters into its fleet in the early 1970s, the ČSA partner Slov-air became the world's first airline whose captain, Ján Mičica, was slain at the controls by a hijacker, the event happening during a hijacking to West Germany. The aircraft involved, OK-ADN is nowadays displayed in the open-air aircraft museum in Martin, Slovakia. After the breakup of the Czechoslovak Federation, the airline adopted its present name in May 1995. By the late 1990s, most of the Soviet aircraft were either sold on to other airlines or retired (a number were preserved), and replaced with Western ones such as the Boeing 737 and Airbus A310, A320, and short-range ATR aircraft. CSA became a full member of the SkyTeam alliance on 18 October 2000. As of March 2007 the airline was owned by the Czech Ministry of Finance (56.92%), Czech Consolidation Agency (34.59%) and other Czech institutions. Also, it had 5,440 employees. On 1 January 2010, the whole non-office ground staff of CSA was transferred to the subsidiary ČSA Support, now named Czech airlines handling s.r.o. In February 2010, ČSA a.s. sold off its Dutyfree shops to another entity. In late 2012, CSA Czech Airlines announced plans for expansion and to resume long-haul flights from summer 2013 with Airbus A330 aircraft between Prague and Seoul. Since March 2013, the company operates direct flights from Prague to Perm, Nice, Munich, Zurich, Seoul and Florence. Upon the completion of stock sales to Korean Air on 10 April 2013, CSA Czech airlines was owned by Czech Aeroholdings, a.s. (56%) and Korean Air Lines Co., Ltd. (44%). On May 14, 2013, Czech Airlines Extraordinary General shareholders' meeting elected Cho Won Tae as a new member of its Supervisory Board. Cho Won Tae replaced Petr Matousek, who resigned from his position in the Supervisory Board. This personnel change took effect the 1st of June 2013 and is the result of Korean Air's equity purchase. In April 2015 Travel Service Group bought 34% of the airline, over which Korean Air had an option. In 2016 the airline returned to profit for the first time in many years. Czech Airlines has its head office, the APC Building, on the grounds of Václav Havel Airport Prague in Ruzyně, 6th district, Prague. On 30 December 2009 CSA announced that it will sell its head office to the airport for CZK 607 million. Since its transformation to a joint stock company in August 1992, ČSA has never paid dividends. The sale of a minority share to Air France was a fiasco leading to withdrawal of the French airline. Subsequently, Antonín Jakubše and Miroslav Kůla stabilised the company and enlarged its fleet. In September 2003, Miroslav Kůla was fired. New CEO, ex-minister Jaroslav Tvrdík, agreed with the unions to increase wages by a third and announced "unprecedented" enlargement of the fleet. In 2005, the financial situation sharply deteriorated. 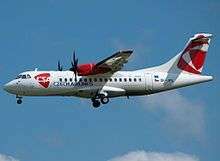 Although the sale of two ATR planes improved the operating result by CZK 198 million, the operating loss was almost half a billion Czech crowns and the Government of Jiří Paroubek replaced Jaroslav Tvrdík with Radomír Lašák. The airline generated further operating losses, despite revenue of CZK 2.1 bn from the sale of almost all real estate and CZK 1.2 bn from sales of planes. In 2005-2010, ČSA generated an operating loss of CZK 3.4 bn; without long-term asset sales revenues, the operating loss would have been twice as large. The gross margin did not even cover the personnel expenses. Czech Airlines currently flies to 89 destinations in 45 countries including codeshare flights. Czech Airlines operates 32 monopoly routes from Prague Airport, including one domestic route to Ostrava, alongside the feeder route from Košice in Slovakia. These 32 routes represent about 40% of total flights and just over 30% of total capacity. On 27 other routes, representing around 40% of flights, the airline faces direct competition from one other carrier, while on the Prague to Amsterdam, Barcelona, Copenhagen, Stockholm, Madrid, Milan, Paris, London and Rome city pairs, the airline faces two or more competitors. In June 2007, CSA signed a contract with Exim Tours, the largest Czech travel agency, extending their contract for another three years. In May 2010, CSA withdrew their last Airbus A310 and Exim Tours signed a new contract with Travel Service Airlines from winter 2010/2011. 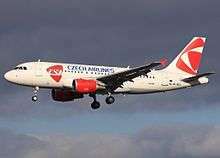 Foreign tour operators, as well as sports teams and companies, use Czech Airlines’ charter flights. 40 Percent of Czech Airlines charter flights are for foreign clients. Czech Airlines charter flights carried 797,299 passengers last year. These are usually operated on an ad-hoc basis. Czech Airlines offers buy on board service on some flights in addition to free service. The OK Plus frequent flyer programme gives passengers "OK Plus Miles" for flights with Czech Airlines, SkyTeam member airlines, other partner airlines or non-airline partners such as hotels, car rentals, banks etc. All these miles can be exchanged for perks such as bonus tickets, upgrades to Business Class, overweight baggage/additional baggage allowance, OK Plus Gifts in the form of gift vouchers, access to airport lounges at Prague Airport, car hire and more. OK Plus membership cards are available with the following tier levels: OK Plus membership, OK Plus Silver, OK Plus Gold, and OK Plus Platinum. The higher the card level, the greater the number of benefits passengers receive. Current Czech Airlines Group uniform was designed by Czech fashion company OP Prostějov Profashion. Borivoj Klug from OP Prostejov, the manufacturer of the new uniforms, said that the collection was developed using "the latest European knowledge and expertise in the area of production technologies." A new look for Czech Airlines was revealed in September 2007. The new logo was created by Michal Kotyza, who works for the airline. A carrier providing other entities with rentals of free capacity in its aircraft, so-called ACMI. Provides ground handling or passenger and aircraft handling for many airlines operating flights from Prague / Ruzyne. Provision and service of ground power units either mobile ground power units or air-bridge units are available. Provides services in personnel consultancy, job placement, organization of specialized courses and training and other educational activities, resp. telemarketing services. At the Czech Aviation Training Centre, operated by the state-owned enterprise Air Navigation Services of the Czech Republic, the airline provides training to future aircrew members, as well as refresher and further training to existing crews. In addition to Czech Airlines, services of the training centre are also used by other airlines. Furthermore, courses “Flying without Fear” and “Stewardess/Steward Try-outs” are offered, as well as the adventure course “Flying for Fun”. These special trainings are also open to public. Joint venture with CSA catering based in Václav Havel Airport Prague and Incheon International Airport. CSA's last fatal accident was in 1977. On August 12, 1930, a ČSA Ford 5-AT-C Trimotor (registration OK-FOR) crashed near Jihlava (Iglau) while attempting to avoid a thunderstorm. The aircraft struck the ground in poor visibility after a sharp turn to avoid a chimney and caught fire, killing 12 of 13 on board. On August 13, 1938, a ČSA Savoia-Marchetti S.73 (registration OK-BAG) struck a wooded mountain near Oberkirch on approach to Strasbourg en route from Prague via Paris, killing all 17 on board, the stewardess survived, but died a day later. On March 5, 1946, a ČSA Junkers Ju 52/3m (registration OK-ZDN) crashed near Prague after two landing attempts, killing 10 of 15 on board. The aircraft was operating a Paris-Strasbourg-Prague passenger service. On November 9, 1946, a ČSA Douglas C-47A (registration OK-XDG) force-landed near Dobrovíz after running out of fuel while in a holding pattern due to bad weather; all 18 on board survived, but the aircraft was written off. On January 25, 1947, a ČSA Douglas C-47A (registration OK-WDS) was struck by a crashing Douglas Dakota while parked at Croydon Airport; there were no casualties, but the aircraft was written off. See 1947 Croydon Dakota accident. On February 13, 1947, a ČSA Douglas C-47A (registration OK-XDU) crashed shortly after takeoff from Ruzyne Airport while on a training flight, killing all three on board; improper maintenance was blamed, leading to a five-day crew strike. On December 21, 1948, ČSA Flight 584 (a Douglas C-47A, registration OK-WDN) was shot down near Pilos, Greece after the pilot became disorientated due to cloudy weather; when the pilot transmitted a flare, this was taken as a threat from the military exercise on the ground and the plane was fired upon from the ground and crashed, killing all 24 on board. The aircraft was operating a passenger service from Czechoslovakia to Israel. On February 27, 1950, a ČSA Douglas C-47A (registration OK-WDY) struck Praded Mountain en route to Prague from Ostrava, killing six of 25 on board. On March 24, 1950; three Douglas DC-3s from Czechoslovakia were simultaneously hijacked. All three planes landed at the US Air Force Base at Erding, West Germany. Twenty-six of 85 passengers chose to stay in West Germany to escape from the Communist regime in Czechoslovakia. On March 23, 1952, a ČSA Douglas C-47 was hijacked by four people who demanded to be taken to Germany; the aircraft landed safely at Frankfurt with no casualties. On January 12, 1954, a ČSA Douglas C-47A (registration OK-WDS) struck a chimney and power lines and crashed near Prague after nearly failing to take off, killing all 13 on board. On January 18, 1956, a ČSA Douglas C-47A (registration OK-WDZ) struck Mount Skapova after the aircraft was blown off course by strong winds, killing 22 of 26 on board. On November 24, 1956, a ČSA Ilyushin Il-12 (registration OK-DBP) crashed into a field near Egislau, Switzerland, killing all 23 on board. On January 2, 1961, a ČSA Avia 14 (registration OK-MCZ) crashed on climbout from Prague during a pilot training flight after failing to gain height on takeoff, killing all 10 on board. On March 28, 1961, ČSA Flight 511 (an Ilyushin Il-18V) crashed in Gräfenberg near Nürnberg during a Prague-Zurich service due to structural failure, killing all 52 on board. On July 12, 1961, ČSA Flight 511 (an Ilyushin Il-18V, registration OK-PAF) crashed near Anfa Airport due to possible crew error, killing all 72 on board. On September 10, 1962, ČSA Flight 306 (an Avia 14, registration OK-MCT) crashed near Slavkov while on approach to Brno, killing 11 of 34 on board. On March 16, 1963, a ČSA Tupolev Tu-104A (registration OK-LDB) caught fire and burned out while being refueled at Santa Cruz Airport, India; the casualty count was unknown. On September 5, 1967, ČSA Flight 523, an Ilyushin Il-18D (registration OK-WAI), crashed on climbout from Gander International Airport while on a Prague-Shannon-Gander-Havana passenger service, killing 37 of 69 on board; the cause was never determined. On October 11, 1968, a ČSA Avia 14-32A (registration OK-MCJ, named Svit Gottwaldov) crashed near Ptice shortly after takeoff from Prague, killing 11 of 40 on board. On June 1, 1970, a ČSA Tupolev Tu-104A (registration OK-NDD, named Plzen) crashed after two attempted approaches to Tripoli International Airport, killing all 13 on board. On August 18, 1970, ČSA Flight 744, a Tupolev Tu-124V (registration OK-TEB, named Centrotex), landed wheels-up at Kloten Airport after the crew became preoccupied with cabin pressurization problems; all 20 on board survived, but the aircraft was written off. On August 29, 1973, ČSA Flight 531, a Tupolev Tu-104A (registration OK-MDE) slid off the runway while landing at Nicosia Airport; all 70 on board survived, but the aircraft was written off. On August 20, 1975, ČSA Flight 540, an Ilyushin Il-62 (registration OK-DBF, named Brno Trade Fair) flew into the ground during a night-time approach to Damascus International Airport due to a mis-understanding between the pilots and the control tower that resulted in an incorrect altimeter setting, killing 126 of 128 on board in Syria's worst ever air disaster. On July 28, 1976, ČSA Flight 001, an Ilyushin Il-18V (registration OK-NAB, named Košice), which was operating as a scheduled domestic passenger flight from Prague's Ruzyně airport to Bratislava-Ivanka Airport, both in Czechoslovakia, which crashed into the Zlaté Piesky (Golden Sands) lake while attempting to land in Bratislava. All 6 crew members and 70 out of 73 passengers died. On January 2, 1977, a ČSA Tupolev Tu-134A (registration OK-CFD) collided on the runway at Ruzyne Airport with a ČSA Ilyushin Il-18 (OK-NAA) that was taking off; all 48 on board the Tu-134 survived, but it was written off; the Il-18 (all six on board survived) was substantially damaged but was repaired and returned to service, it was retired in 1981 and is now in a museum. On February 11, 1977, a ČSA Avia 14T (registration OK-OCA) struck trees and crashed near Ivanka Airport due to crew error, killing four of five on board. On October 11, 1988, a ČSA Tupolev Tu-134A (registration OK-AFB) landed hard at Ruzyne Airport; there were no casualties, but the aircraft was written off and flown to Piešťany where it served as a restaurant. On June 9, 2012, a Czech Airlines ATR 42-500 (registration OK-KFM) was destroyed in a hangar explosion and fire at Ruzyne International Airport. A second ATR 42 (OK-JFK) was also damaged by the fire. Two Czech Airlines Technics employes were working with an explosive liquid. The liquid was sucked into a heavy technic vehicle, which then blew up at the plane and caused the fire. ↑ "Ceske Aerolinie (Czech Airlines)". TRANSNATIONALE.ORG. ↑ Accounting statements of Český Aeroholding, a.s. for 2014, page 11, auditor Deloitte Audit s.r.o. ↑ "CZECHOSLOVAKIA: Mutiny in the Air Lanes". Time. 3 April 1950. ↑ "Mutiny In The Air Lanes", Time Magazine, Monday Apr 3rd 1950. ↑ "EU competition regulators investigate Czech Airlines". Reuters. 23 February 2011. Retrieved 28 February 2011. ↑ volaspheric: CSA Czech Airlines to resume long-haul operations? ↑ "The Settlement of Land Relations between Czech Airlines and the Prague Airport Authority to Increase the Value of Both Companies Prior to their Privatisation." Czech Airlines. 22 August 2008. Retrieved on 15 February 2010. ↑ "Imprint." Czech Airlines. Retrieved on 4 February 2010. "Letiště Ruzyně Prague 6 160 08 Czech republic"
↑ Heijmans, Philip. "Czech Airlines sells headquarters to Prague Airport." The Prague Post. 8 January 2010. Retrieved on 15 February 2010. 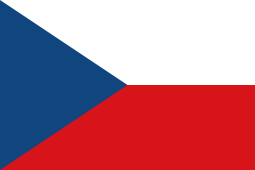 ↑ "Profile on CSA Czech Airlines". CAPA. Centre for Aviation. Archived from the original on 2016-10-30. Retrieved 2016-10-30. ↑ "Dublin Airport Chartered & Scheduled Airlines". Dublin Airport Authority (DAA). ↑ "Inflight Menu." Czech Airlines. Retrieved on 7 March 2009. ↑ "12. 12. 2008 – Czech Airlines to Expand the Options to Purchase Additional Services." Czech Airlines. 12 December 2008. Retrieved on 7 March 2009. ↑ Accident description for OK-FOR at the Aviation Safety Network. Retrieved on 23 September 2013. ↑ Accident description for OK-BAG at the Aviation Safety Network. Retrieved on 23 September 2013. ↑ Accident description for OK-ZDN at the Aviation Safety Network. Retrieved on 23 September 2013. ↑ Accident description for OK-XDG at the Aviation Safety Network. Retrieved on 23 September 2013. ↑ Accident description for OK-XDU at the Aviation Safety Network. Retrieved on 23 September 2013. ↑ Accident description for OK-WDN at the Aviation Safety Network. Retrieved on 23 September 2013. ↑ Accident description for OK-WDY at the Aviation Safety Network. Retrieved on 23 September 2013. ↑ Hijack description at the Aviation Safety Network. Retrieved on 23 September 2013. ↑ Hijack description for OK-WDY at the Aviation Safety Network. Retrieved on 23 September 2013. ↑ Accident description for OK-WDS at the Aviation Safety Network. Retrieved on 23 September 2013. ↑ Accident description for OK-DBP at the Aviation Safety Network. Retrieved on 23 September 2013. ↑ Accident description for OK-MCZ at the Aviation Safety Network. Retrieved on 23 September 2013. ↑ Accident description for OK-PAF at the Aviation Safety Network. Retrieved on 23 September 2013. ↑ Accident description for OK-MCT at the Aviation Safety Network. Retrieved on 23 September 2013. ↑ Accident description for OK-LDB at the Aviation Safety Network. Retrieved on 23 September 2013. ↑ Accident description for OK-WAI at the Aviation Safety Network. Retrieved on 23 September 2013. ↑ Accident description for OK-MCJ at the Aviation Safety Network. Retrieved on 23 September 2013. ↑ Accident description for OK-NDD at the Aviation Safety Network. Retrieved on 23 September 2013. ↑ Accident description for OK-TEB at the Aviation Safety Network. Retrieved on 23 September 2013. ↑ Accident description for OK-MDE at the Aviation Safety Network. Retrieved on 23 September 2013. ↑ Accident description for OK-DBF at the Aviation Safety Network. Retrieved on 23 September 2013. ↑ Accident description for OK-CFD at the Aviation Safety Network. Retrieved on 23 September 2013. ↑ Accident description for OK-NAA at the Aviation Safety Network. Retrieved on 23 September 2013. ↑ Accident description for OK-AFB at the Aviation Safety Network. Retrieved on 23 September 2013. ↑ Accident description for OK-KFM at the Aviation Safety Network. Retrieved on 23 September 2013. Zeman, Libor (2003). Czech Airlines 1923/2003 - For 80 years at home in the skies. Prague: Czech Airlines.